Product prices and availability are accurate as of 2019-04-17 03:56:33 UTC and are subject to change. Any price and availability information displayed on http://www.amazon.com/ at the time of purchase will apply to the purchase of this product. 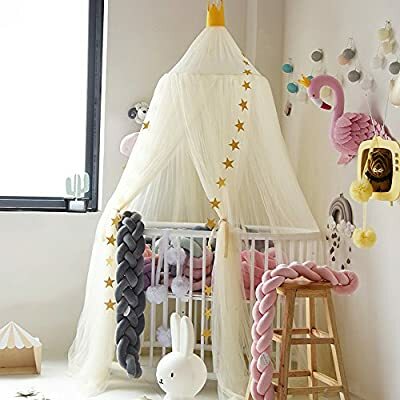 Description: Material: 100% Cotton Color: Pink, Grey, White, Beige Dimension: Height: 2.4m; This net will fit any size bed including Twins Bed, Single Bed and Children Bed. It is perfect for hanging over sky bed, crib, hammock or room corners in the children's room because it can create a safe, soothing and cozy feel for it. NOTE:An upgraded version of mosquito net has been launched,we have updated the yard of the Princess play tent net Our Upgraded Mosquito Net Made of polyester material?If you have any questions, you can contact us 2.4 meters high in large size, perfect for a queen size bed or any size in between. Our upgraded version of the bed nets include: mosquito nets, hooks, 3M glue, two screws, two straps, a alloy circle, a star decoration, cotton crown, paper crown For a little girls or boys room or a bedroom makeover, beautiful and functional, hanging ring in center, round dome bed canopy, creating a beautiful girl's princess bed.